It's been THREE WHOLE DAYS since the Cat Sitter snuck out of the Townhouse. I keep looking for her, but I can't find her anywhere. Don't tell, but even the Boss has been snooping around her room. Yes, the room formerly known as the Kitten Room, formerly formerly Katie's Room, is now The Cat Sitter's Room. She was super fun and I can't wait to see her again. I've got a secret! Glogirly says she's coming back next week for when Glogirly goes to BlogPaws! The Boss is already getting ready to spend some quality me-time (I mean her-time, um you know...Boss-time) under the bed. In the meantime, the Cat Sitter Room is ready! You haven't registered for BlogPaws??? Well, What are you waiting for???????????? Listen - this is your chance. Get sitter to give you extra treats - momma won't know! waffles, you're looking good. will you tell katie the sitter is coming back? Yeah, you need to watch out fur The Boss & the sitter's suitcase. We're glad you enjoy her. It's so sweet that she stays at the house, not just stop by! 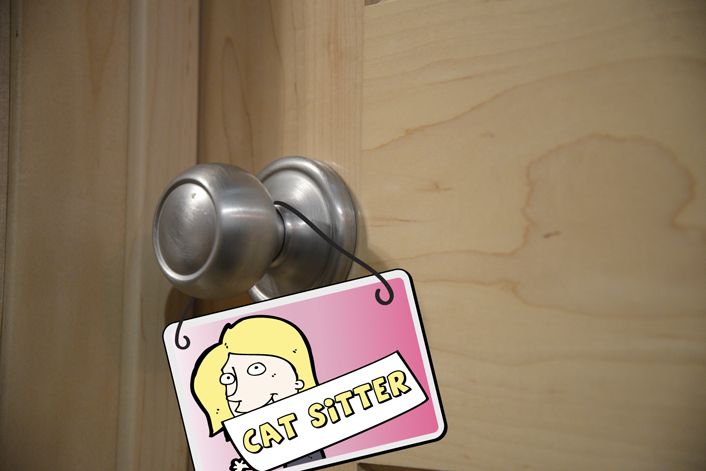 We can't wait for THE RETURN OF THE CAT SITTER! What will Katie have up her paw? Yikes we are so excited. Have a wonderful Wednesday. Katie, are you practicing your quick-zip skills so you can zip Waffles into the cat sitters luggage during this trip? 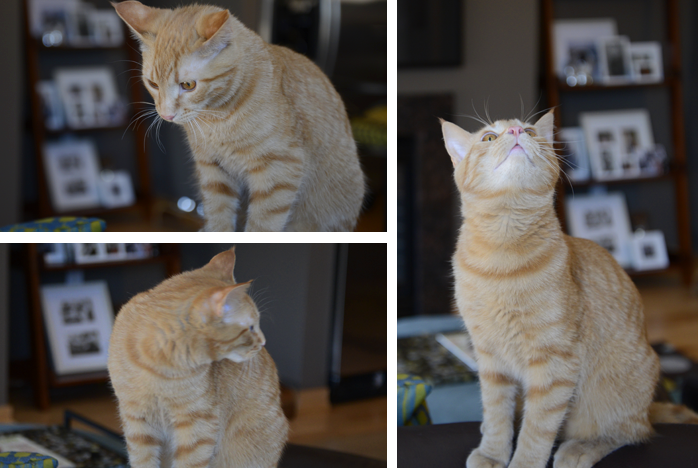 Waffles, good thing you like your cat sitter! The mom says to tell Glogirly she'll see her at BlogPaws! We're glad that you like your cat sitter Waffles. Ohhhh Waffles!!!!! You are sooooooooooooo precious that I can't stand it!! Can't WAIT to FINALLY MEET YOUR MAMA!!!!!!!! Waffles you are too cute! You have a great mom to find such a perfect sitter for you. Hope you all have a wonderful Wednesday! That *is* a fabulous portrait, well done to your Cat Sitter! We assume she will give you extra treats and food, of course, to make your human's absence bearable. Especially since you were just abandoned so recently! Awww you look so sweet Waffles! I'm sure Katie won't be happy that Glogirly is leaving again. I'm sure she'll have a great time at BlogPaws though! Well THAT is fun, Waffles. 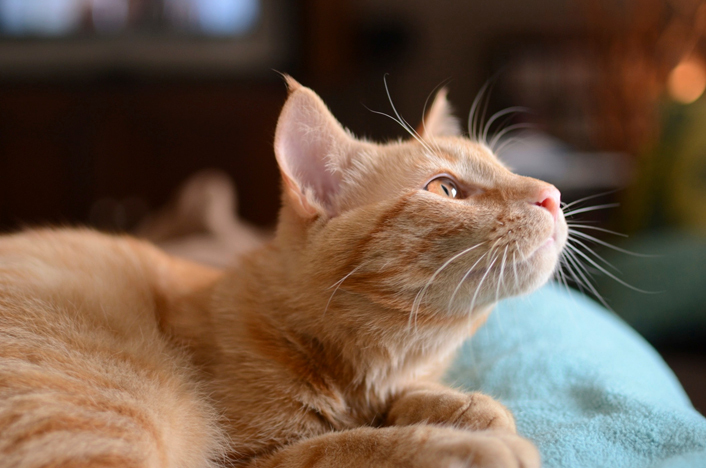 Does your cat sitter travel cross country to do cat sitting work? We could use here here too. We had assumed Glman was going to be the cat sitter, so we hope he is going along to Blog Paws and will enjoy it too. Good that you enjoy being with the cat sitter. Maybe it's better than going to a pet hotel like I did the other week! 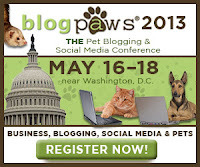 I didn't think Waffles would go to BlogPaws, but I wonder if I will meet Katie. I forgot to ask Caren if it was OK to ask some of the bloggers for their autograph. It sure will be tempting. dood...well at leest ewe haz her picture rite ther ya can look at...may bee purrhaps when her visitz next week... her will give ewe a picture of just herself tho.... with out her name cross de front....hope yur peepulz hada awesum fun trip ! What a lovely pic of Waffles Too he is gorgeous and obviously soo smitten with teh cat sitter. Never mind Katie, hopefully the cat sitters return will only be a short one. You are lucky - MY pet sitter for BlogPaws is my human's boyfriend. That's right, he will still be around while my human is away. And he is not very good - he does not play with me and he hangs around with the dog all day. And sometimes he forgets to keep an eye out while I'm eating and then Binga steals my food! Why Waffles Too, we think you are truly smitten! We're so happy your mommy came home. Waffles Too, if you really want to have Katie think well of you, you should tell her how happy you are that mommy is home and that you missed her, too. Hooray for you, Waffles! We bet you'll have lots of fun with the Cat Sitter. Don't tell Katie, though! The cat-sitter is probably loading up on treats for you guys. Yaaaay for awesome cat sitters! I'm sure the cat sitter misses you too. Have a purrfect day! Waffles it is so nice that yous likes your cat sitter. Purrhaps Katie can packs yous in her suitcase the next time she comes and goes! I bet Waffles 2 would be a big hit at Blogpaws! Hint, hint. And we'd love to meet him (and his mom, of course). Glad you are looking forward to the cat sitter. Sorry you are not going to BlogPaws too! Happy Wordless Wednesday (on Monday)!